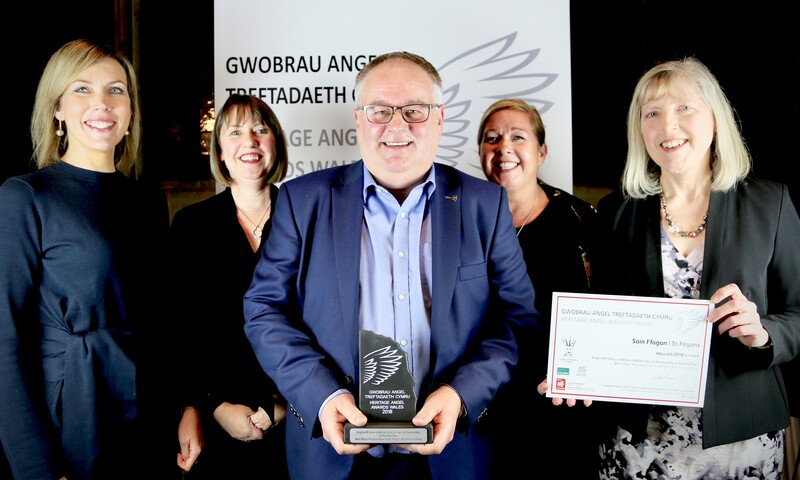 Heritage Angels – people who have played a special part in caring for Wales’s heritage – have been honoured at a special awards ceremony, sponsored by the Andrew Lloyd Webber Foundation, at Caerphilly Castle on 8 November 2018. Chaired by Baroness Kay Andrews, a panel of distinguished judges gave awards to five projects, recognising the achievements of young people, apprentices, volunteers and historic building restoration work. Thornhill Primary School won the Best Contribution to a Heritage Project by Young People award for their Armistice Cantata, a musical play based on popular tunes from the First World War. Women’s Archive Wales won the Best Heritage Research, Interpretation or Recording Project award for their Voices from the Factory Floor project. Volunteers captured the memories of hundreds of women who did factory work between 1945 and 1975, often as the family’s chief breadwinner. Matthew Roberts and Brett Burnell were given the award in the Best Craftsperson or Apprentice category, thanks to their work at St Fagans National Museum of History where they have built a reconstruction of the great hall of Prince Llywelyn’s thirteenth-century palace complex on Anglesey, to be used for history lessons and to host school group sleepovers. The award for the Best Rescue of a Historic Building under £5 million went to Yr Ysgwrn: Home of Hedd Wyn, the Welsh farmer-poet, who was posthumously awarded the bard’s chair at the 1917 National Eisteddfod having lost his life at the Battle of Passchendaele. St Fagans National Museum of History won the Best Rescue of a Historic Building over £5 million, for their transformation of the museum’s grade II- listed main building to create spectacular light-filled spaces housing the museum’s rich social history and archaeology collections and a new learning centre. The winner of the public vote – based on all fifteen of the projects shortlisted for an award – is Insole Court, the Grade II*-listed neo-Gothic mansion in Llandaff saved by community effort and restored from dereliction to provide a community hall, café and visitor centre. In presenting the awards, Baroness Andrews said: ‘The judges were knocked out by the range and quality of all the projects and people nominated for an award. It was agonising to have to make a choice from so many projects that demonstrate genuine commitment and enthusiasm for the heritage. This year’s successful Welsh projects (excluding the public vote winner) will now go on to be considered for the prize of overall winner alongside their English, Northern Irish and Scottish counterparts at the London ceremony on 27 November 2018.